“Post-Europe“ is a trilateral youth-theatre-project between the three partnerorganisations from the cities Weimar (GER), Blois (FR) and Bydgoszcz (PL), the “Deutsches Nationaltheater & Staatskapelle Weimar”, the “Europäische Jugendbildungs- und Begegnungsstätte Weimar”, the “Teatr Polski Bydgoszcz” and the “service jeunesse” in Blois. 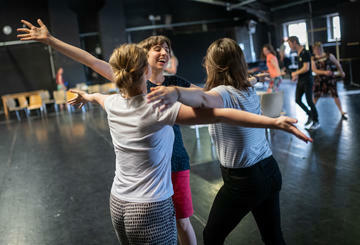 In three consecutive encounters in all three countries, 18 teenagers aged 15-18 (six from each city) get to know each other in theatre workshops, dance and movement trainings and poetry and spoken word studios. They spend their free time together, get to know each other’s cultures. They build a collective and develop a performance dealing with the following questions such as: How do we get to know each other despite language barriers and cultural differences? What common language can we find? What do we know about Europe? How do we experience Europe in our daily lives? Which events, worries and wishes do we share and how do we differ from each other? How does the Europe, that we want to live in, look like? And what vision for the future of Europe do we have? The results, explorations and visions come together in a theatre performance that is shown in the “Woche der Demokratie” (week of democracy) at the “Deutsches Nationaltheater Weimar”, at the planned ceremonial act of the “Deutscher Bundestag” (German federal parliament) and the Landtag (state parliament) for the 100th anniversary of the “Nationalversammlung” (national assembly) coming together in Weimar. This project gives a progressive answer to the challenge of the European idea through populist and right-wing conservative movements that gain ground in all three countries.Teenagers from different countries, different educational backgrounds and social preconditions get a space to express their similarities, differences, wishes and fears concerning Europe today and to illustrate their visions for the future in an artistic way. This theatre-research-project motivates teenagers to deal with daily politics and the European idea in a critical way and to put their own lives and those of others in relation with each other. The developed ideas for a shared Europe are presented at the above-mentioned ceremonial act and submitted to the European Commision. Thereby the impact of this project goes beyond the borders of the three countries.